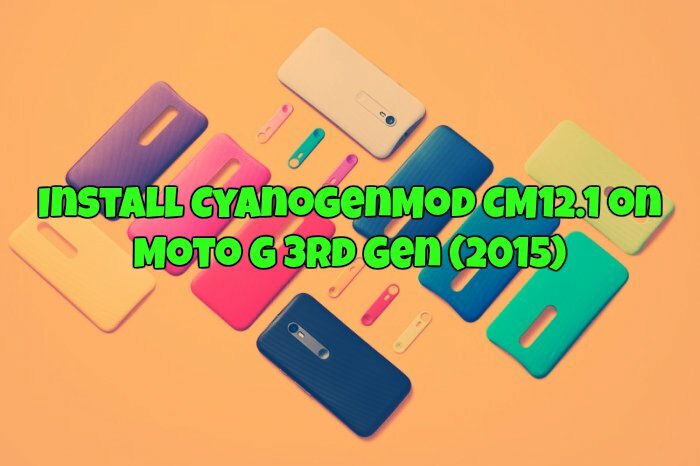 If you are the proud owner of Motorola’s latest Moto G (2015), now you can update your phone with CyanogenMod CM12.1 Android 5.1.1 custom ROM. CyanogenMod CM12.1 is one of the best custom ROM with lots of features and customizations. You can find all these features on your Stocks ROM, so most of the android users always want to install the CM ROMs on their phone or tablets. Now you can also install the CM 12.1 on your latest Moto G 3rd Gen (2015) and use it as a daily driver. Here in this post we let you know how to install the same on your phone and how to use this new ROM on your phone. The process is very simple and all you have flashed some files on your phone and you are done. Before getting started, do take the full backup of your phone, read our guide here how to take the full backup of android. Once the backup is done, follow the below mention instructions in this tutorial and read all the steps carefully and follow them step by step on your Moto G.
Step 1. First you have to unlock the bootloader of your Moto G and install the TWRP recovery. Don’t know how to do that, Check this guide to install TWRP and Unlock bootloader. Step 2. Download Android 5.1.1 CM12.1 Nightly ROM and Google Apps for Moto G (2015) to your computer. Step 3. Now connect your phone to the PC with USB cable and move both the zip files on your phone memory / SD card. Step 4. Once the zip files are moved. Switch off your phone and boot in recovery mode. To do this, Switch ON the phone while pressing and holding Volume Up + Power buttons together. Step 5. Once your phone is recovery mode, GO to wipe > Advanced wipe and Wipe Cache, Dalvik from the phone. Step 6. Now go back to the main recovery main menu and Select the Install option and select the CM 12.1 Zip file and flash it. Step 7. After that Flash the Google App zip file. Step 8. After the successful installation completes, go to recovery main menu and reboot the phone by selecting “reboot system now”. That’s it! Now your Moto G 3rd Gen (2015) is running on the CyanogenMod CM12.1 Custom ROM.